I have always loved ribbon embroidery, I love it’s texture and vintage feeling. As many of you know, we just moved our stores into a bigger space in New York and one of the perks is that we get to carry some items we never had room for before. When I saw that we were now carrying little packets of silk ribbon for embroidery I knew I wanted to try it out so I took a handful of beautiful colors home for some research. It turns out that ribbon embroidery is very similar to regular embroidery, which I absolutely love, so it wasn’t long before I was hooked! 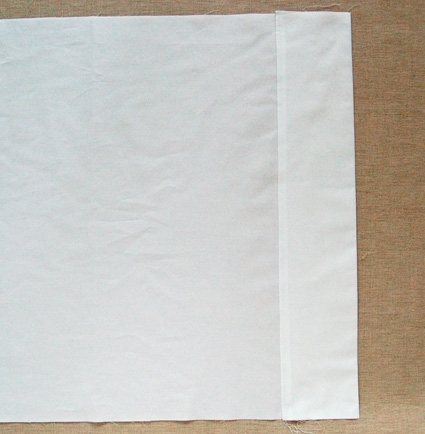 Cut the fabric into four 36-inch by 21-inch pieces. Put two of them aside, you will use them for the second pillow. For the remaining two pick one piece to be the back and the other to be the front. For the back piece of the pillow: Lay the piece horizontally. Using the water soluble marker make three vertical marks at a 1/2-inch, 4 1/2-inches and 9-inches from the right hand 21-inch side. For the front piece of the pillow: Mark the piece in same way as for the back only start from the left hand 21-inch side. Then mark a 6-inch tall by 4 1/2-inch wide rectangle at the bottom left corner. Finally, mark a 1/2-inch line horizontally at the bottom of the rectangle. 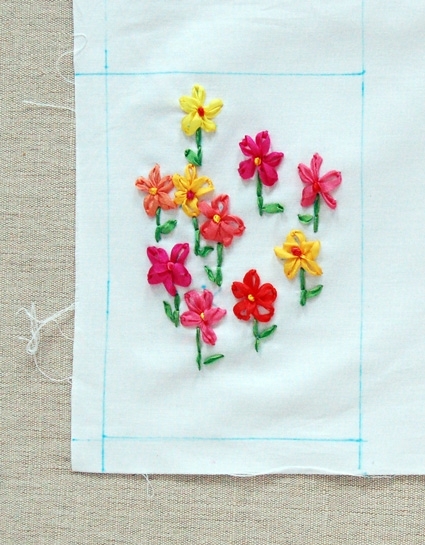 This rectangle is the area for the embroidery. 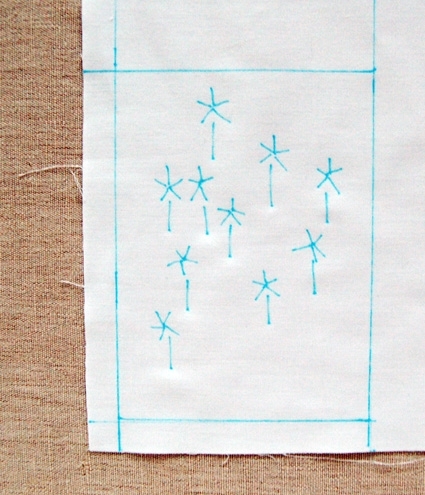 Draw 8 to 11 very simple five-pointed flower shapes with stems as shown above. Do not draw them too close to the edges of the marked rectangle. 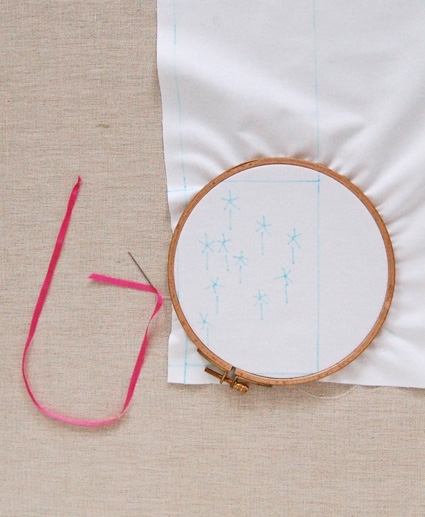 Place the marked bottom left corner of the front piece into an embroidery hoop and thread an embroidery needle with a 16-inch length of silk ribbon. 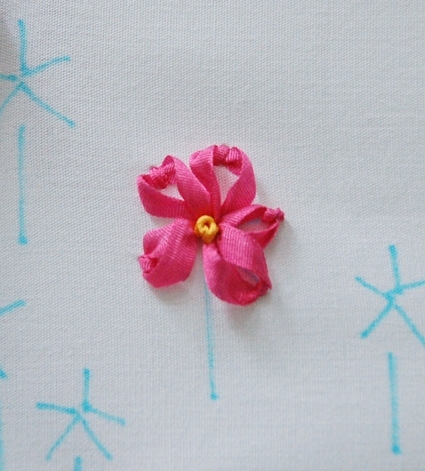 Enter the fabric with your needle from the back through the center of one of the flowers. Pull the ribbon all the way through and then turn around, placing your needle back into the same place you came out of originally but don’t pull yet. 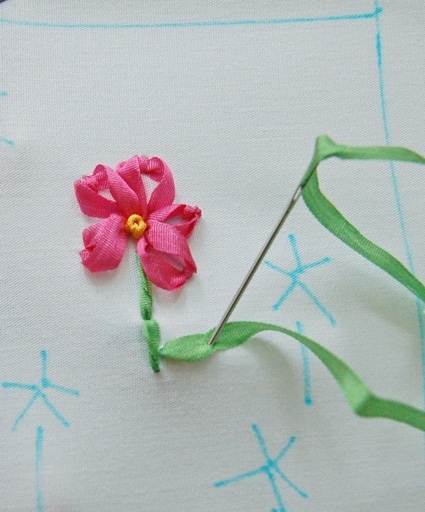 Poke your needle through vertically to to top of the petal marking as shown above. 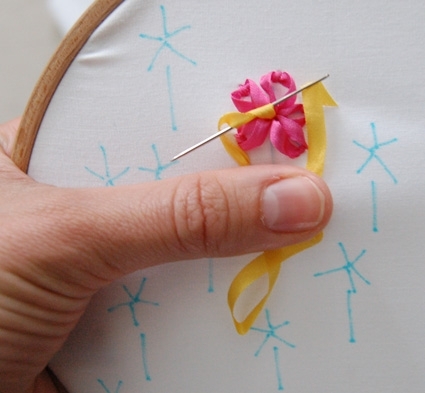 Pull needle out and pull the ribbon until the little loop looks like a small petal as shown above and then place the needle back into the same spot where you just came out. You’ve now got one petal. 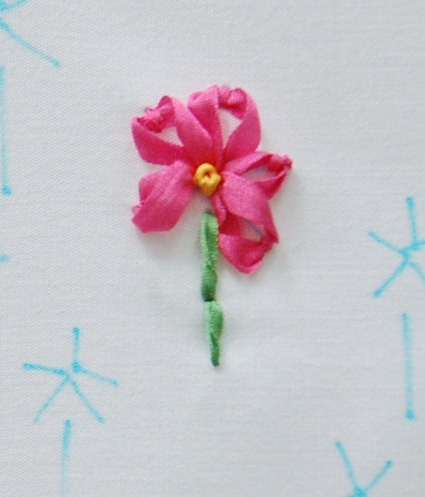 Do this for all five petals, always starting each petal at the same middle point. Thread your needle with another color of ribbon. Enter the fabric from the back at the flower’s center point as shown above. Wrap the ribbon around the needle a couple of times very close to the fabric. Poke the needle back into the center point with the ribbon still wrapped around it and pull it through to the other side. You’ll have this beautiful little knot in the center. 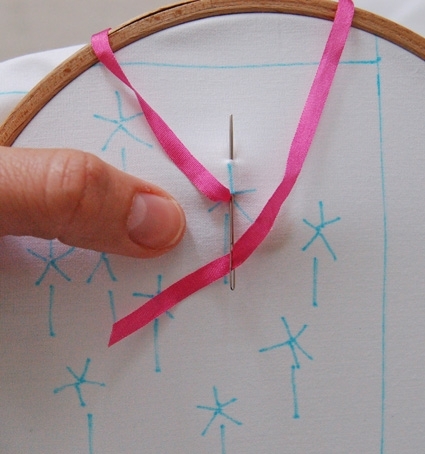 Thread your needle with a third color of ribbon (most likely green). Enter the fabric from the back to the front, about half way down your marked stem. 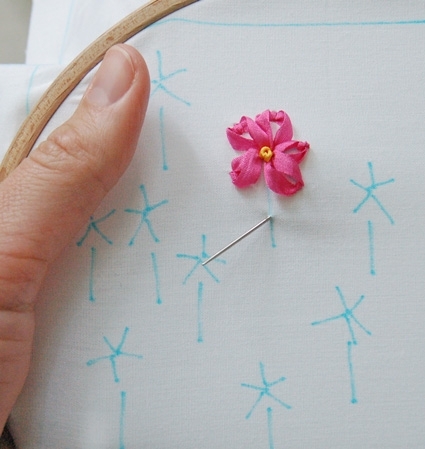 Poke your needle back into the fabric at the top of the marked stem. 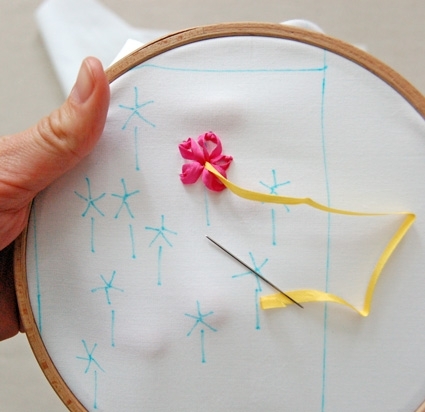 Then come out again at the bottom of the stem, and then place your needle at the beginning point of your first stem stitch and pull the ribbon through. The stem is now finished! Pull the ribbon out somewhere along the bottom of the stem. Then pierce the center of the ribbons width as you stick your needle back into the fabric about 1/4-inch from where you came out as shown above. 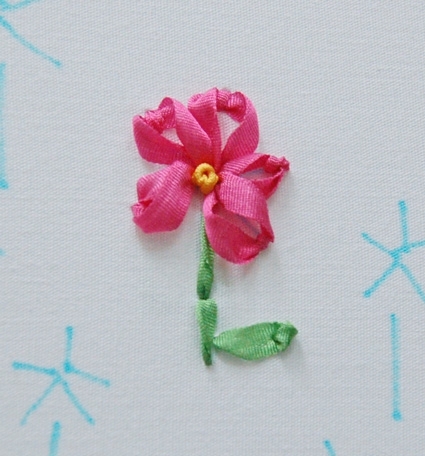 Do not pull this ribbon stitch very tight, or else it’s pretty end will dissappear. Your full flower is now complete. 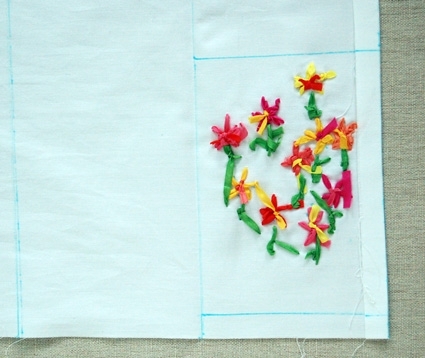 Repeat these steps for all of the flowers you drew on in the marking step. Turn the front pillow piece over so the wrong side of the embroidery is facing up and is oriented at the lower right had side of the piece. Fold and press down a 1/2-inch vertical fold (along the first marking) towards the left. Then fold the embroidered section over along the second marked line and line up the folded edge with the final vertical marking. 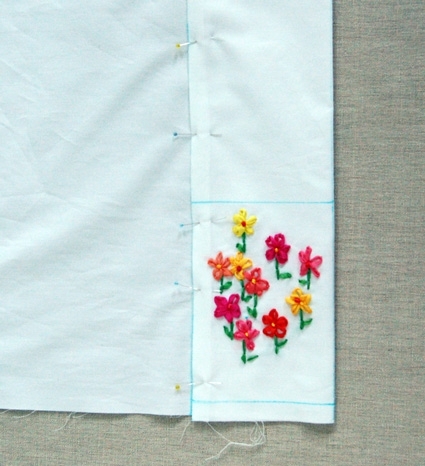 The right side of the embroidery will now be facing up and the raw edge will be folded inside this deep hem. Press and pin the fold down. Sew the fold down with a 1/4-inch seam allowance. 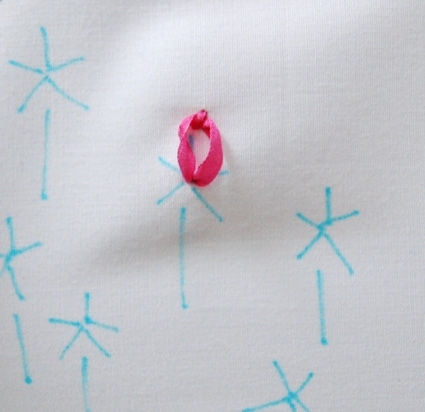 Fold and sew the marked edge of the back piece in the same manner along the markings. 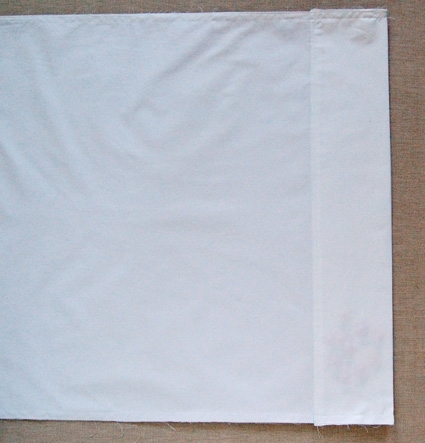 The side with the fold on top is now the right side. 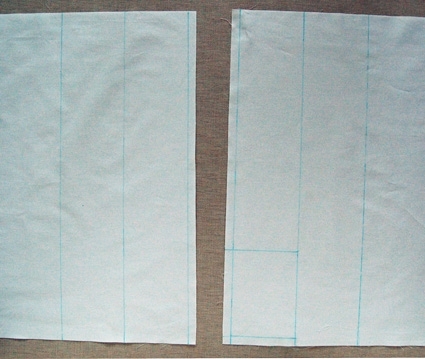 Pin the front and back pieces right sides together, with their deep hems lined up. 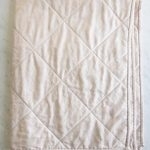 Sew them along the three raw sides with a 1/2-inch seam allowance and then zig zag stitch along the raw edges for a neater finish. Turn the pillow case right side out and press it flat. 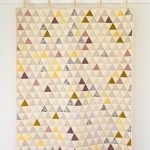 Repeat all steps to make the second pillow case and you’re all done! 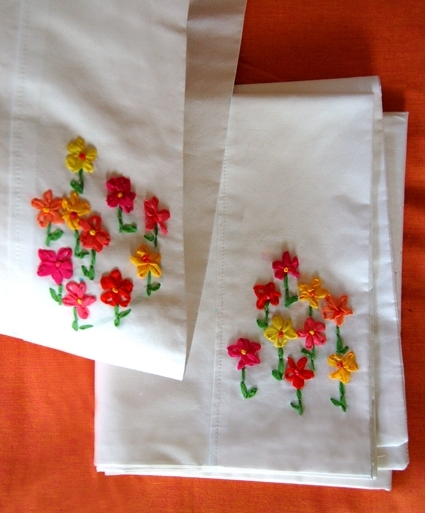 When I was five my Aunt used my Mom’s table cloth and drew flowers and other things for me to learn how to do embroidery. Your flowers bring back some lovely memories! Thanks-they are very cute! Is the ribbon washable? I love the way they look, but I’m worried about its use in my boy-friendly household. Just so lovely, simple and clean. 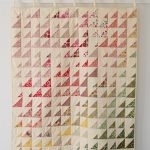 This has made me want to go back to work and bring home armfuls of ribbon! I think it would be better not to make the deep hem on the back but to make a fold instead, so that you have something to tuck the pillow into. These would make sweet bridal gifts. Zoomed me right back to my 70’s childhood. love doing ribbon embroidery … it’s been a long while since I did but think I NEED to make a few of these lovely pillow cases! thanks for the inspiration! I’m having a summer sewing camp at my home in June , for girls ages 9- 12, and this is going to be one of the projects. 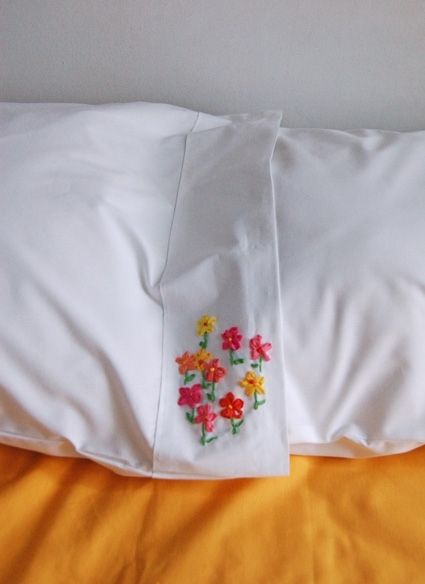 I had planned on embroidered pillowcases and love the idea of introducing them to the use of silk ribbon. 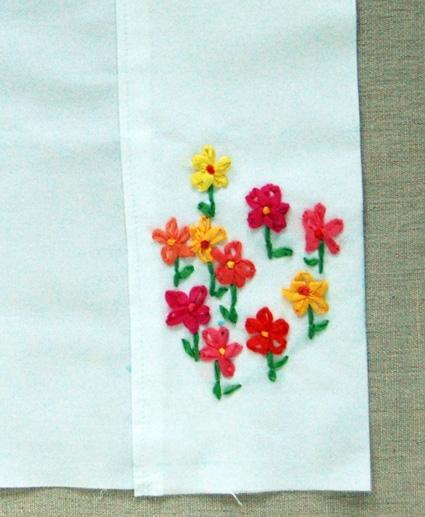 We are also doing your Spring Napkins, with slight modifications. We are using a small floral on one side with a complimentary solid on the other. 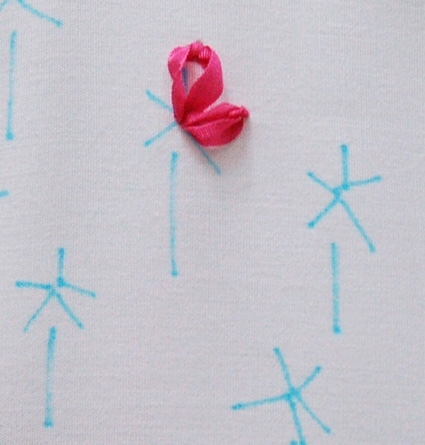 The girls will embroider their initial on the solid side and use their napkins at a tea party on the last day of camp! Thank you for all of your work; truly professional and inspiring. P.S. 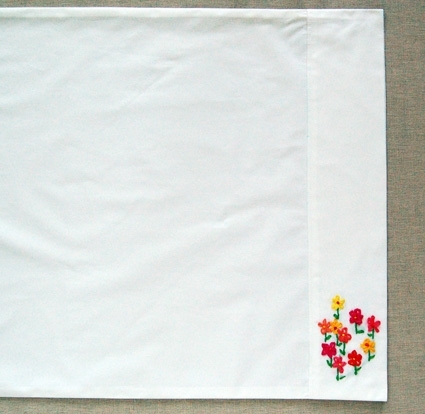 I was thinking these pillowcases would be great for a new bride … what do you think! Too pretty and really great and encouraging lesson! Gorgeous. Just one question: how do these wash up? This looks so easy and so cute. Thanks for the great tutorial. Beautiful!!!! Thank you for the tutorial! Love this tutorial, I tried to do this before and it did not work. After looking at this, I can try again:) Thank you! They are so beautiful and indeed, cheery. I just started getting into embroidery and I may have to try my hand at ribbon embroidery now. Thanks for sharing! Gorgeous! I'd keep the pen markings as light as possible because sometimes they don't disappear entirely. I've a sweater I need to finish up that has exactly this kind of embroidery. BTW, for Chicago locals, Vogue Fabrics in Evanston has some beautiful packaged ribbon for like a $1 a package, perfect for pillow embroidery. My Mother-in-Law use to make beautiful ribbon embroidery, but she lived so far away that I never had the chance to learn. I have tons of ribbon, I enjoy making beautiful pillow cases and since I live in Hawaii, I can adapt to Hawaiian looking flowers. These are a perfect gift for a bride or for Mom's Day. Mahalo for the refresher course. 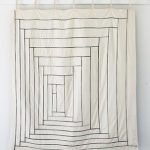 I just found this on allfreesewing.com. 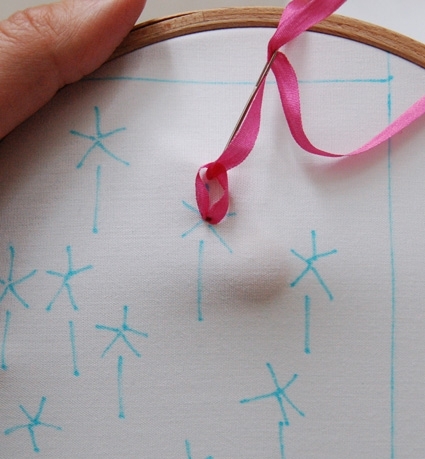 I've never heard of embroidery with ribbons – I love it! Now I have to try it. When I learned to ribbon embroidery, I was taught to wash my ribbon first in hot water, in case it bled. After it dried, I ironed the wrinkles out. Beautiful work, and so simple instructions. Love it. I have been wanting to try ribbon embroidery for some time and this tutorial has inspired me to get on with it. Thank you for sharing your skills. such a beautiful thing, I hope i can do it thank you! 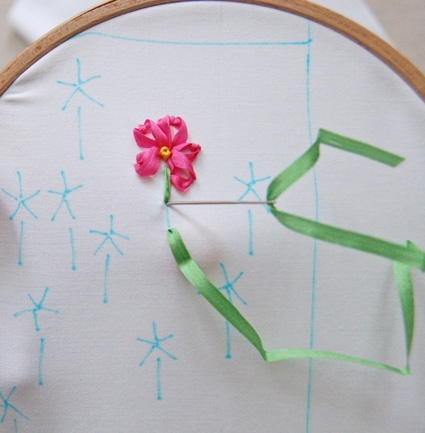 How do you anchor the thread before you start stitching, and end it once you finish the flower? I’m assuming with knots because there don’t seem to be enough stitches to weave the tails under? Yes, you tie a knot at the beginning and end. Thanks for your question!